As often stated, the long-term proprietary model flipped positive in October 2008 and has NEVER turned negative since then. Currently, the intermediate model remains constructive, but the short-term model has registered a “soft” cautionary signal. That is likely due to the number of new lows swamping new highs, the RUT underperformance, and the lack of short-term energy. To that point, according to our models the past two sessions were pretty critical in that they should have vaulted to the upside and that just has not happened. This lack of direction, and subsequent failure to foster an upside breakout, makes us have to consider that on a trading basis, the mid-November energy peak, instead of being an upside inflection point, may just mark the end of a downside reaction low. Accordingly, we are recommending selling some trading positions, yet we are undeterred on our secular bull market theme that has years left to run. We are writing this Wednesday night without the use of the preopening futures, but our sense is the S&P 500 registered an “inside day” on Tuesday and it was not resolved yesterday, because the SPX was unable to hang on to its morning gains. If Tuesday’s intraday low of 2919.37 is violated to the downside, sellers should materialize, because there will have been three failed rally attempts this week and bonds are nipping at our heels. The news is that this market decline is due to higher interest rates and fear that they will continue to go higher. However, have you noticed that the utility sector is rallying in the face of this market decline? If it is all about interest rates, utilities should be feeling the brunt of this decline, but the opposite is occurring. Do you think something else is going on? I do. 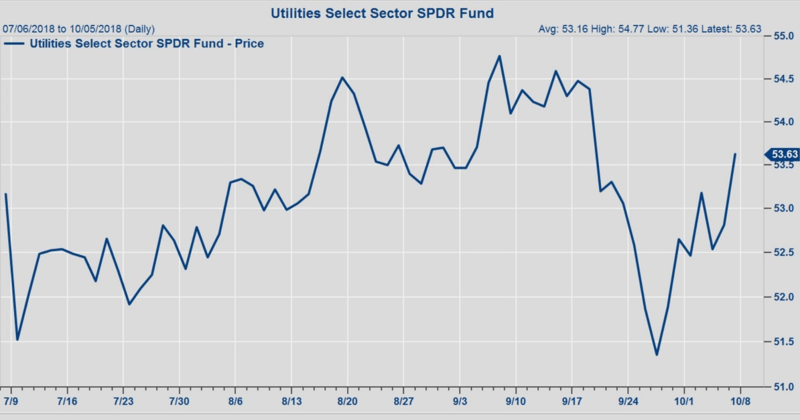 Taking a look at the Utilities SPDR (XLU/53.63) confirms Joe’s insight (chart 1 below). While we have argued for two years that we do not want to own the Utility Sector, due to our sense that interest rates were going to rise, we must admit, if you can identify a utility stock that is increasing its dividend at a faster rate than the Fed is raising interest rate, it is likely a decent investment. October will mark the 10th anniversary of the great bull market (on 10-10-08 was when 92.6% of stocks made their yearly annual lows: read BOTTOMED). From there, the nominal price-low bottom of March 2009, the S&P 500 is up more than 330%, yet investors are bearish. Worldwide, investors are not pessimistic, but downright fearful. I know that from talking to fund managers, strategists, brokers, and investors around the world. Clearly, investors are still haunted by the last bear market and their fear is being reinforced by the daily bombardment of black headlines. Clearly, interest rates have been rising because of the strong economy and the concurrent decent economic numbers. Take last week’s employment report. The last time the U.S. unemployment rate was 3.7% was in December 1969 as the economy was overheating, inflation was soaring, and a recession was soon to follow. Could that happen again? It is very unlikely in the near term, as the Present Situations Index is definitely not telegraphing it. However, fears of such a sequence materialized last week, causing a slide in stocks. As for support levels, the SPX’s 50-day moving average (DMA) is at 2876 and the 100-DMA is at 2817. We do not expect this zone to be violated on the downside. Viking Therapeutics, Inc. is a clinical-stage biopharmaceutical company that engages in the development of novel therapies for patients suffering from metabolic and endocrine disorders (read fatty livers). Its clinical program, VK5211, treats patients recovering from non-elective hip fracture surgery. It also specializes in development of VK2809 and VK0214. The call for this week: Our short-term model registered a “soft” cautionary signal after Tuesday’s closing bell. The McClellan Summation Index is below zero for the first time in six months and has also turned negative with stocks near their all-time highs. 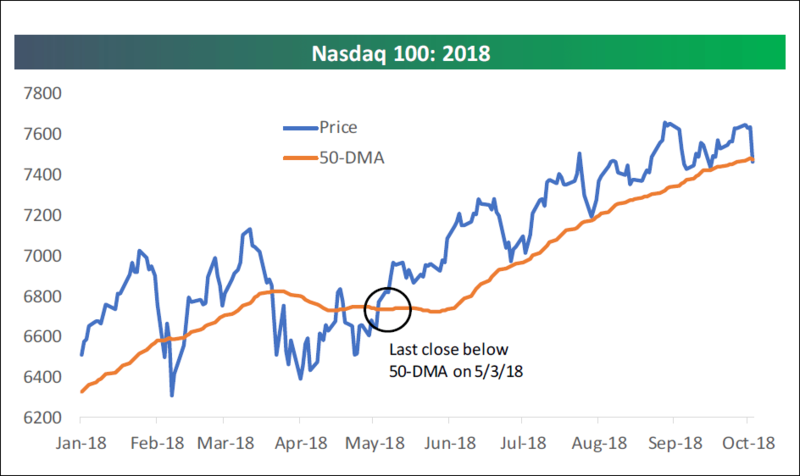 Meanwhile, the NASDAQ 100 closed below its 50-DMA for the first time since May (chart 2, page 3). That is likely driven by the FANG stocks on the revelation that China has implanted tiny “spy chips” in many of the FANG stocks’ servers (chart 3, page 3). Support levels for the SPX are the 50-DMA at 2876 and the 100-DMA at 2817. We do not expect this zone to be violated. However, even a pullback to 2817 would not “dent” this secular bull market. This week there is a fairly strong negative energy blast due, but it should subside by week’s end.